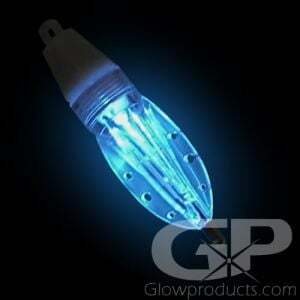 Underwater fishing lights, fishing glow sticks and LED fish lights are popular night fishing lights. Choose from a selection of light up LED fish lights and glow sticks for fishing. Submersible LED fishing lights are used for catching game fish near the shore or for deep sea fish trolling. Choose from the LED Flashing Fish Lights, Larger Game Fishing LED Light or from a variety of glow sticks for fishing. Get your catch today with glowing fishing lights! Let's Glow Fishing! Glow in the Dark Night Fishing Lights. Hey - the fish are biting! So let's go! Fishing at night offers up a number of opportunities – if it has been exceptionally hot, fish will feed at night when it's cooler near the surface. Fish will also feed at night nearer the surface when there are less predators around. And it can be just more convenient for the fisherman. It's cooler, and it's a great way to potentially maximize your fishing time. So let's dive a little deeper into the world of night fishing. There are a few different uses of LED Lights and glow sticks for fishing. The first is as equipment markers and identifiers and the second is as fish attractants. Let's get into the equipment marker side first. As you may have noticed, it can get pretty dark at night. There might not be much in the way of street lights and other ambient urban lighting where you are fishing. You're going to need to see your equipment just to make sure it's still where you want it to be or so you know if a fish has struck your bait. Glow sticks are a great way to mark your equipment because they are bright and 100% waterproof. You can use larger 6 Inch Glow Sticks or the Flashing LED Fishing Lights to mark your planer boards when trolling at night, smaller 1.5” mini glow sticks or the 2” Mini LED light sticks as rod tip lights – you are going to want to know when a fish is on! 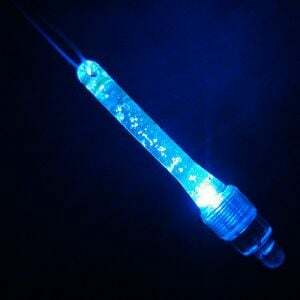 Use 2 Inch Mini LED light sticks or the 3 Inch Fishing Glow Sticks as bobber lights and bait/hook lights. 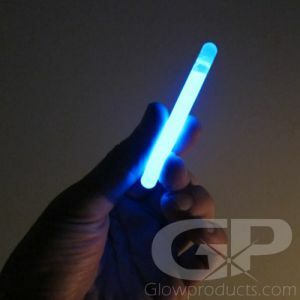 The other use for glow sticks and LED Fishing Lights is as a fish attractant. There's a couple of different ways the lights work. Potentially these lights will just attract the fish that you are after. Both halibut and swordfish are known to be directly attracted to light and you can use our LED Game Fishing Lights. It is thought that some fish are attracted to the light as their natural prey – some squids and bio-luminescent plankton naturally emit light. And some fish are just curious and want to check it out. The other way that glow sticks and LED fishing lights work is by attracting plankton. The plankton that are attracted to the light then in turn attract bait fish. Which then attracts the bigger game fish that you're looking for. And remember to try a couple of different colors. Some fish seem to be more attracted to green and blue lights while others go for red. So get out there and go for it. It will be cooler, it won't be as crowded and it's often calmer at night. Just remember to have your gear ready and organized and light it up properly. 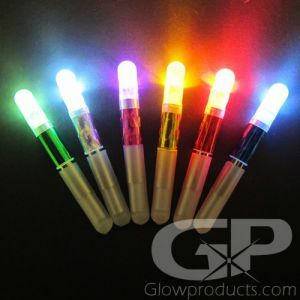 And if you're using glow or LED fishing lights as a fish attractant, take some time to experiment with different colors. Stay safe and have fun – tight lines!